This report draws upon the ongoing monitoring of news and development by SNHR team, and on accounts by survivors, eyewitnesses, and local media workers, as the report contains two accounts that have been collected by speaking directly to eyewitnesses and are not cited from any open source, in addition to analyzing a large number of videos and pictures that were posted online or sent by local activists. The report sheds light on a notable drop in attacked vital civilian facilities in May which saw a number of agreements that resulted in Syrian regime forces, backed by Russia, completely seizing control of south Damascus, as well as areas in northern suburbs of Homs governorate. The residents of those areas were forcibly displaced to north Syria. In the wake of those agreements, rates of bombardments by Syrian-Russian alliance forces have notably dropped. The report adds that a significant increase in numbers of bombings in the areas that aren’t under the control of Syrian regime forces was recorded. 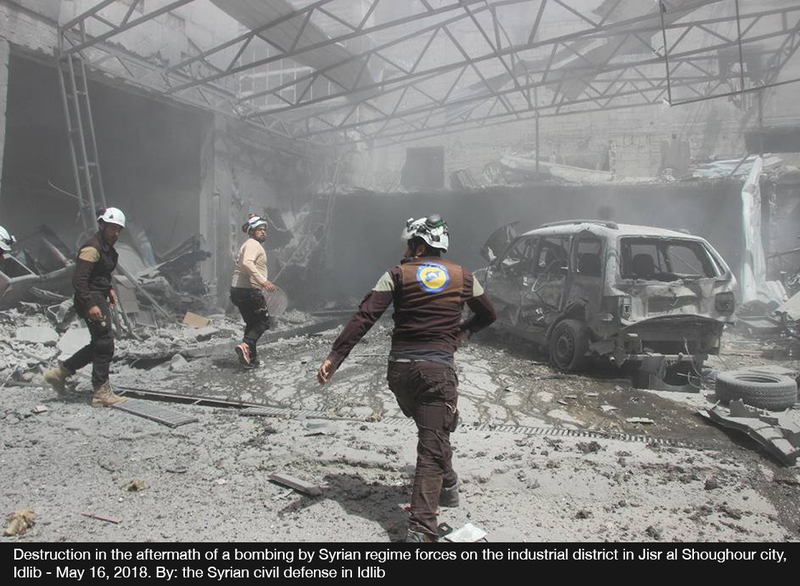 Some of these bombings resulted in damages to vital civilian facilities, as most of those were in Idlib governorate which also saw the majority of May’s attacks with a percentage of 81%. The report documents 415 attacks on vital civilian facilities since the start of 2018. In addition, May saw no less 21 attacks on vital civilian facilities which were divided into three by Syrian regime forces, six by Russian forces, and 12 by other parties. The report breaks down the vital facilities that were attacked in May, which were as follows: seven infrastructures, six places of worship, one vital medical facility, four vital educational facilities, two refugee camps, and one international humanitarian insignia.